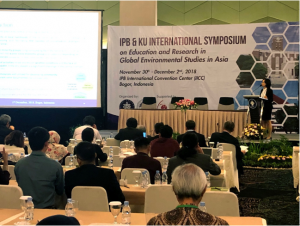 From 30 November through 2 December, Kyoto University and Bogor Agricultural University (IPB) held the “International Symposium on Education and Research in Global Environmental Studies in Asia” in Indonesia. 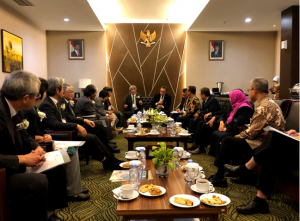 The event was sponsored by the Embassy of Japan in Indonesia, Japan Society for the Promotion of Science (JSPS), Japan Student Service Organization as an event of the 60th Anniversary of Diplomatic Relations between Japan and Indonesia. 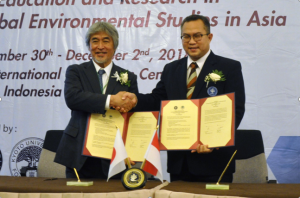 Funding was provided by JSPS and Japan’s science and education ministry MEXT. 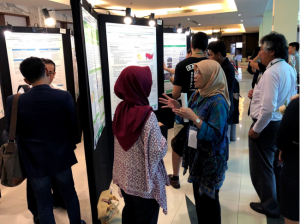 Attendees totaled 195 from 9 Asian countries — 161 researchers and students from 19 universities, and 34 representatives of other organizations. The Symposium opened with an address from IPB Vice Rector Dodik Ridho Nurrochmat. Six sub-sessions and the tour in Bogor Botanical Garden folloed. Day two afternoon featured a plenary session on international collaboration of education and research in Asia. Opening remarks from IPB Rector Arif Satria and KU President Juichi Yamagiwa were followed by a congratulatory address from Mr Keiichi Yamaguchi, first secretary at the Embassy of Japan. Signing ceremonies of extending the MOU on academic cooperation between Kyoto University and Bogor Agricultural University, as well as of establishing a double degree program between Kyoto University and Tsinghua University. 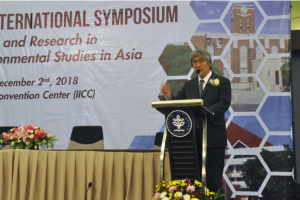 Keynote lectures were delivered from Professor Ernan Rustiadi, head of the IPB Center for Reginal Planning and Development Studies, and Professor Eiji Nawata, dean of the KU Graduate School of Agriculture, followed by research presentations by students and young researchers on environmental studies topics. IPB Rector Arif Satria, and Professor Shigeo Fujii of the KU Graduate School of Global Environmental Studies delivered the closing remarks. The three-day event wrapped up on 2 December with two study tours: the Gunung Halimun National Park, and the Prasadha Pamunah Limbah Industri (PPLi). During the Symposium, President Yamagiwa and other KU representatives paid courtesy visits to the IPB President. Other activities held in conjunction with the event include a meeting of KU Indonesian Alumni with 110 participants, and a “Study in Kyoto and Bogor Fair”, which attracted 200 students from local universities and high schools.